Judicial register required for openness in court. 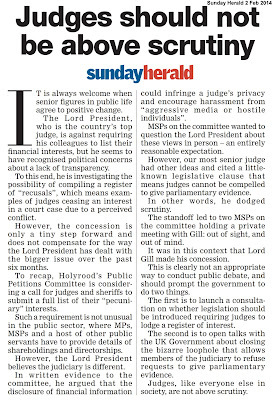 EVIDENCE accumulated as a result of a four year probe by the Scottish Parliament on proposals to require judges to register their interests - points to the inescapable conclusion there is a need for a fully published and publicly available register of interests for the judiciary. 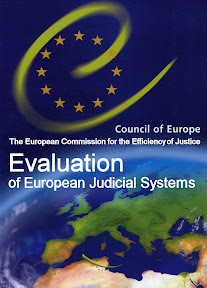 The overall impression reached by many involved in the debate around judicial interests is that creating such a register with full declarations by judges will enhance public trust in judges, and bring the judiciary into line with transparency rules which apply to all other branches of Government. Note: This article will be updated as new submissions and evidence are published by the Petitions Committee. Petition aim: Calling on the Scottish Parliament to urge the Scottish Government to create a Register of Pecuniary Interests of Judges Bill (as is currently being considered in New Zealand's Parliament) or amend present legislation to require all members of the Judiciary in Scotland to submit their interests & hospitality received to a publicly available Register of Interests. 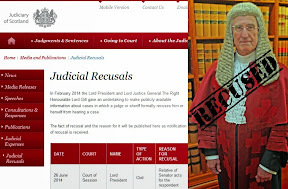 16 April 2013: The Committee agreed to write again to the Lord President and seek views from the Judicial Appointments Board for Scotland and the Judicial Complaints Reviewer. Link to Media report - What is there to hide? Transparency register now essential for judges. 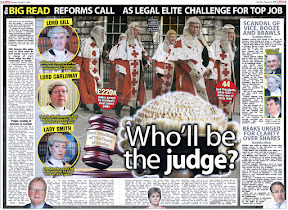 THEY HAVE the power to strike down legislation from our elected Scottish Parliament, enact their own versions of the law with Acts of Sederunt, suspend your liberty, and dodge questions on their activities - yet figures reveal Scotland’s secretive judicial elite who control our courts – have received a staggering £471 million of public cash for salaries and judicial related ‘activities’ since the financial crash of 2008. 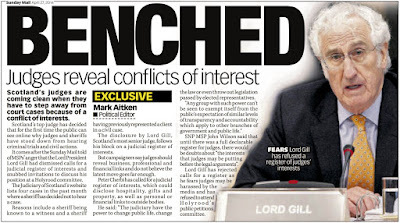 Judges on up to £230K a year - some holding judicial posts for well over twenty years, have also directly benefited from a massive £885 million of public cash thrown at Scotland's courts since 2008 - including a £58 million taxpayer funded refit of Parliament House – the headquarters of Scotland's current Lord President & Lord Justice General - Lord Carloway. 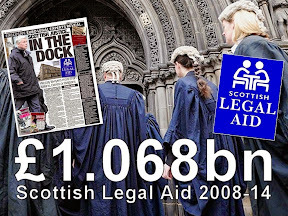 And, don’t forget the staggering £1.207 billion of legal aid – yet another public cash subsidy for the legal profession to prop up our creaking, expensive and exclusive billion pound courts who close their doors as soon as they hear the word “transparency”. Yet - the collection of Senators of the Court of Session, temporary judges, sheriffs of varying titles, tribunal & land court judges – (around 265 in number) and an army of up to 450 justices of the peace - declare not one single interest, connection, item of wealth, property value, or paid outside work, outside of revelations in the media of judges' links to big banks & dodgy businesses contained in the SCTS Board register. 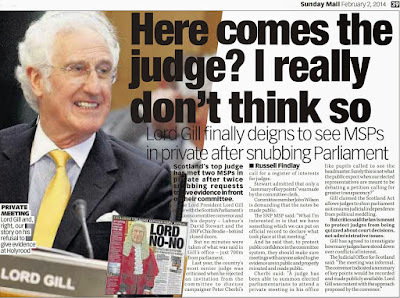 There is no other group in society who are allowed such a privilege of secrecy - while benefiting directly from billions of pounds in public cash. The weak, disabled and most vulnerable in society are strip searched and harassed day & night, whenever they dare ask for help. Even an elected councillor, msp and all other public officials must tally up their stationery costs and claims for rubber bands. 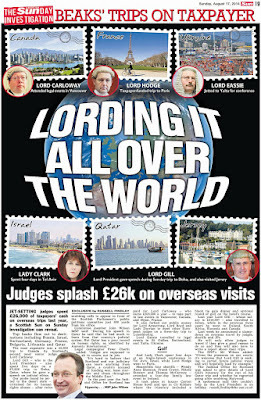 Yet there are no questions, requirements of transparency or accountability for the judiciary - who jet set at-will around the world on taxpayers cash, operate a judicial version of a diplomatic service and rake in cash for speeches, conference attendance, and legal work - without fear of having to declare one single item of their wealth, connections to despots, the rich & powerful and links to big business - in public. By any stretch of the imagination, this scenario, is shocking. The figures - sourced from the Scottish budget on judicial salaries, travel, junkets, ‘training’ and various enterprises operated by the Judicial Office for Scotland falling under the term “Courts Group” to various related courts & tribunal support entities- reveal the total spend on Scotland’s judiciary since 2008 stands at £470.6m. Courts Group had overall responsibility for financing the cost of the Judiciary, including Scottish Government contribution to the superannuation costs of the judiciary, for the fees to part-time judiciary, for the running costs of a number of small departments and other judicial expenses (training and travel etc). Judicial salaries are defined as non-voted spending which is met from the Scottish Consolidated Fund but is also part of the Departmental spending limit. 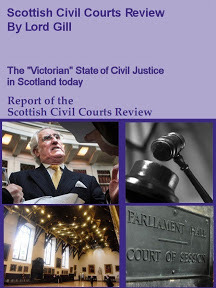 Courts group was renamed Courts, Judiciary and Scottish Tribunals Service during 2012. In the latest Scottish Government 2016-2017 budget, the designation defining judicial costs is tagged as “Judiciary”. 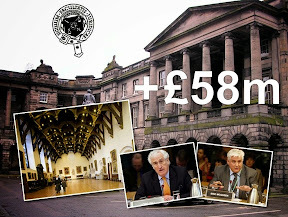 Figures sourced from the Scottish Budget reveal the total spend on Scottish Courts and Tribunals Service (SCTS) since 2008 stands at £884.7m with the added-in £58m for the Parliament House refit. 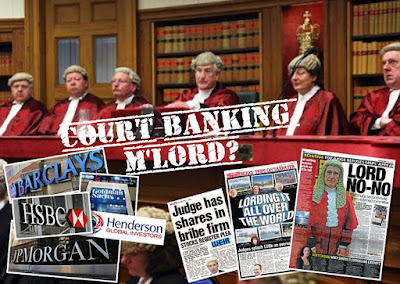 Budget spend on courts: 2007-2008: £79.4m, 2008-2009: £81.3m, 2009-2010: £94.7m, 2010-2011: £93.5m, 2011-2012: £79.9m, 2012-2013: £77.0m, 2013-2014: £72.3m, 2014-2015: £72.3m,2015-2016: £87.4m (includes missing £11.1m from courts group responsible for Judiciary), 2016-2017: £88.9m (includes missing £11.1m plus - from courts group responsible for Judiciary). 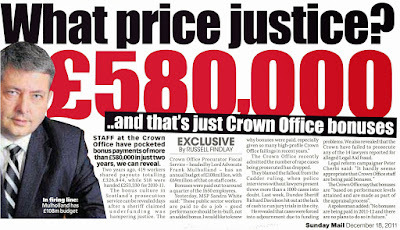 As you read these facts and figures, remember – this is about how public cash to the tune of half a billion pounds is spent by a group of the most powerful people in the land - who resist declaring their interests, how the judiciary operate, create umbrella institutions without accountability and outwith the scope of Freedom of Information laws, make policy on their own and operate without any oversight. The existing lack of judicial transparency and accountability allows this to continue, unchecked and unchallenged. There is a proposal to create a new layer of transparency and accountability to the judiciary as exists in all other areas of public life. 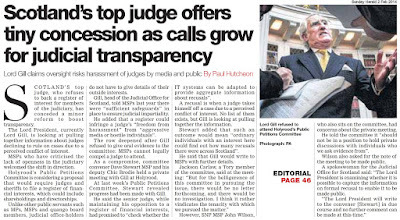 In an effort to bring greater transparency to Scotland’s judiciary - Petition PE1458: Register of Interests for members of Scotland's judiciary - first debated at the Scottish Parliament’s Public Petitions Committee in January 2013 – calls for the creation of a publicly available register of judicial interests – containing information on judges’ backgrounds, figures relating to personal wealth, undeclared earnings, business & family connections inside & outside of the legal profession, membership of organisations, property and land, offshore investments, hospitality, details on recusals and other information routinely lodged in registers of interest across all walks of public life in the UK and around the world. 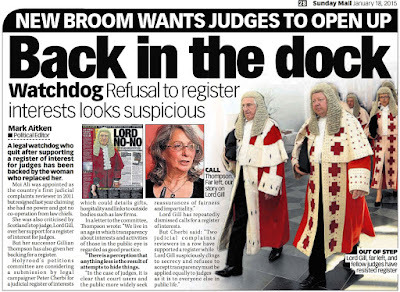 The proposal to create a register of interests for Scotland’s judges’ is also backed by the highly talented individuals who were appointed to provide oversight of judicial complaints – Scotland’s first Judicial Complaints Reviewer (JCR) – Moi Ali, and the current JCR – Gillian Thompson OBE. The full transcript of evidence from former JCR Moi Ali to the Scottish Parliament during her term as Judicial Complaints Reviewer can be found here: Evidence from Scotland’s Judicial Complaints Reviewer Moi Ali to Public Petitions Committee on Petition 1458 Register of Interests for Scotland’s Judiciary, video footage of the hearing can be viewed here: JCR Moi Ali gives evidence to Scottish Parliament on a proposed Register of Judicial Interests. 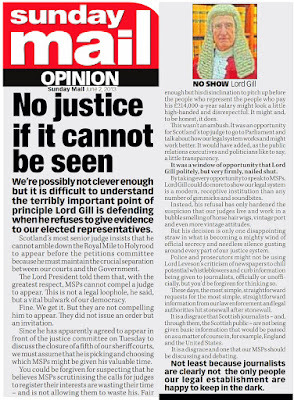 Read the full report & transcript of JCR Gillian Thompson’s evidence to the Scottish Parliament’s Public Petitions Committee here: REGISTER, M’LORD: Former top judge Brian Gill called to Scottish Parliament as Judicial watchdog tells MSPs - Judges should declare their interests in public register. 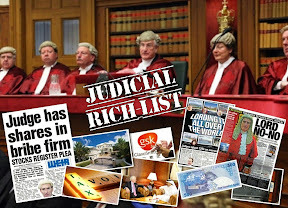 JUDICIAL REGISTER: What interests are currently declared by Scottish judges? 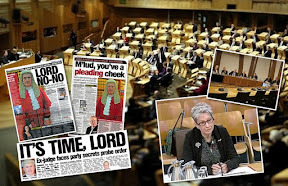 The latest declarations by a select few powerful judges who control the running of Scotland’s Courts – is more revealing in what is missing from the limited disclosures in the 2016 annual report of Scottish Courts and Tribunals Service (SCTS). 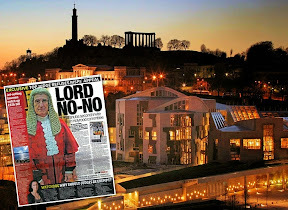 Ruling over our courts in their ermine robes - in some cases decades longer than any Prime Minister could hope to remain in office – the handful of judicial declarations after years on the bench and millions in taxpayers cash - are even less than newly minted msps cobble together in their first few weeks at Holyrood. 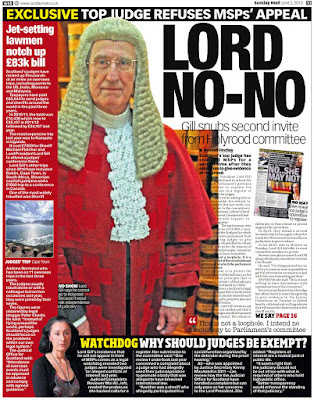 Decades of near £200K taxpayer funded salaries produce singular declarations for a handful of judges, while the other 700 members of Scotland’s judiciary declare not one single item. Questions to ask your solicitor – walk if you don't like the replies. IN SCOTLAND, there are few, if any non lawyer controlled sources of advice to legal services consumers on how to manage client relationships with solicitors, how to control legal costs, and what to do when something goes wrong and your lawyer rips you off. Client protection - is a myth. 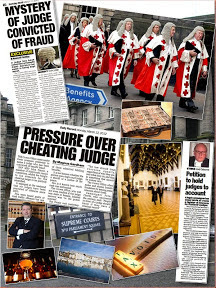 Given three decades of evidence that thousands of clients have been ripped off every year by their once trusted solicitors, the only people who believe a complaints system run by lawyers, managed by lawyers and protected by lawyers - are fantasists, and the Law Society of Scotland. 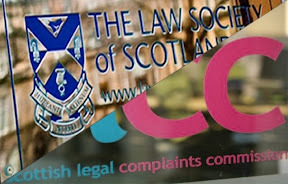 There are no background record checks available on Scottish solicitors, and the only ‘help’ on offer to clients when their relationship with their solicitor breaks down – is provided by the pro-lawyer Scottish Legal Complaints Commission (SLCC), a regulator backed by the Law Society of Scotland, staffed by members of the Law Society of Scotland. You get the picture. 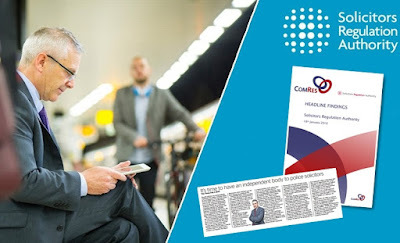 However, in England & Wales, the landscape is a little more consumer friendly, with the Legal Ombudsman (LeO) and Solicitors Regulation Authority (SRA) providing a more independent form of advice and help to consumers. The Solicitors Regulation Authority also publish complaints and regulatory data on solicitors and law firms – a must have service for anyone considering using a solicitor which does not currently exist in Scotland. As things currently stand in Scotland – if you are unable to check up on your solicitor’s regulatory history via an independent source, the best advice is to walk away - or what happens next is your own fault. 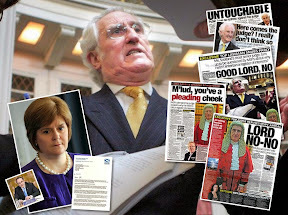 Self regulation by lawyers, pleas to the Scottish Government and Scottish Parliament for help will not put right your legal problems or what your solicitor did to you. A handy guide published by the Legal Ombudsman, reprinted by DOI in this article, gives a list of ten questions consumers and clients of solicitors should ask their legal representatives before taking on representation and expensive legal services. There are further tips in the full LeO leaflet, so please download it and read thoroughly before engaging legal representation. This guide was written for the English legal services market, and you may be an English reader, so go right ahead and ask you solicitor these ten basic questions on costs. However, the same questions apply as much in Scotland as anywhere else - and anyone using a Scottish solicitor should consider asking these same questions. If you don't like the answers you receive, or don't get any answers at all - then the best consumer advice possible is to protect yourself and walk away. At the very least, you will have saved yourself hundreds, or thousands or tens of thousands of pounds for something involving a lawyer which may well have ended up going wrong anyway. Why put yourselves through a five year heartache losing your savings to a lawyer, when ten little questions and answers may save you a whole lot of trouble. The introduction to the leaflet from the Legal Ombudsman states: “If you use a lawyer, he or she should talk to you about the cost of their services. But you should also understand their charges. We have come up with ten questions to ask your lawyer about the cost of your service. We've also included some top tips and explained the terms used to help you get the most from conversations with lawyers about costs. As a consumer, you have the right to expect your lawyer to be clear about how much they are likely to charge you, and for the final bill to be clearly explained and in the range you expected. Legal services can be complex and the final cost can depend on things such as the type of service, individual details of the case, and how events develop. The expertise and experience of the lawyer may affect things too. However, most services are straightforward and your lawyer should give you a clear idea of what you will be charged from the start. Even if things do get complicated, your lawyer should warn you when this happens, so there shouldn't be any surprises in your final bill. Question 1 Will I be charged for a consultation? Finding the lawyer who is right for you and the service you need is important. A consultation by phone, face-to-face, letter or online can help you make your decision. A lawyer can charge you for a consultation but they should tell you before you book and explain any conditions. For example, they may offer the first 30 minutes free but charge for time above that. A lawyer should speak to you about costs and provide the best possible information so you can make an informed choice. If you have a consultation, make the most of the opportunity. Do your research to find the right lawyer - you can check online, talk to friends and family, or speak to consumer organisations to help you make your choice. Question 2 "How do you cost your service?" This question can help you shop around to get best value for money. Two lawyers may provide very different estimates for the same service. Understanding why the quotes differ can help you make the right decision. For example, one lawyer may be more experienced or an expert in the area of law your case involves. If you have a complex case, you might think it's better to pay more as it may improve the outcome and cost you less in the long run. With a fairly simple case you might decide you don't need that level of expertise, so it may be better value to go with the cheaper estimate. Experience and skill are just two reasons why costs may differ. There are now more ways than ever to provide a legal service which can have an impact on what you pay. For example, you can now buy services that are phone or web based rather than face-to-face. Providers who offer this type of service may save on rent and backroom costs and might therefore offer a cheaper price to customers. Understanding if this type of service works for you will help you decide if it is, or isn't, value for money. Estimates may vary for a whole host of reasons. Ask questions until you understand enough about the services on offer so you can pick one that suits you. Question 3 "Can you tell me more about the way you charge?" Lawyers have different ways of charging and their charging method may also vary according to the service. For example, they may offer a fixed fee for writing a will, but an hourly rate for a probate service (the administration of a will when someone has died). Find out what charging method the lawyer will use and ask them to explain it to you in detail. Questions 4 and 5 help with understanding fixed fee and hourly rate charges. Conditional fee arrangements (CFAs) are also known as 'no win, no fee' arrangements. If you lose, you won't, in general, have to pay your lawyer's fees, but may need to pay some out of pocket expenses such as barrister's fees or court fees. You may also be liable to pay some of the other side's costs but it is possible to get insurance to protect against this. If you win, you will have to pay your lawyer's fees and in addition there is usually a success fee which is intended to cover the risk that the firm are entering into with this type of agreement. You should in most cases, however, be able to recover your fees (including any success fee) from the other side. If you are thinking about entering into one of these arrangements, make sure you ask detailed questions so that you fully understand the terms and conditions. Contingency fee agreements are also a type of 'no win no fee' agreement. If your lawyer agrees to represent you under a contingency fee agreement -- which should not be confused with a conditional fee arrangement - they will be able to claim a percentage of any money they win on your behalf plus expenses. If you lose the case, you won't be charged a fee, but you might still have to pay other costs (which could include the other side's legal costs too). The contingency fee percentage must be agreed in advance. You should also check whether the lawyer will deduct any expenses before they take their contingency fee or after as this can make a significant difference to the amount you finally receive. If the percentage you are asked to pay is very high, you could end up with very little - even if you win. Question 4 "What is a fixed fee and what does it cover? Will I be charged for any other costs? The term 'fixed fee' can be used in different ways. It can be easy to assume that it covers all costs for the service you need. In some cases that may be true, but it may also just refer to the lawyer's fees. For example, a 'fixed fee' in a property case may, or may not, include charges related to searches. Sometimes a lawyer may offer a 'fixed fee' for a stage of the case, so don't feel embarrassed about asking your lawyer exactly what they mean by 'fixed fee'. It's not a silly question; the term isn't self-explanatory. Lawyers will sometimes give you an estimate of the costs. This isn't the same as a 'fixed fee', so check what your lawyer means. This can be important as sometimes a lawyer may charge a fixed fee for a particular stage but give an estimate for the next stage. If that happens, or you aren't sure, check what your lawyer means and ask for an estimate for the total cost of the case. Question 5 "You charge an hourly rate but I'd like an estimate for the cost of the whole service. What will my final bill look like?" If your lawyer charges an hourly rate, they must give you an estimate of how much the overall service will be. This should compare reasonably with your final bill. If you aren't sure, then ask your lawyer to give you an estimate for the whole service. Sometimes it can be hard to predict how much it will all cost. Ask so you know how certain the estimate is. Having a range of costs might be more helpful than a single number, which could shift up or down. The important thing is to understand how much the total bill could be. You are entitled to ask the lawyer to set a limit on the costs. This means your lawyer has to check that you are happy to continue if the spend approaches the agreed threshold. Setting a limit can help you make sure you don't spend more than you can afford. Ask questions to understand exactly when the clock starts. For example, if you call your lawyer for an update on your case will you be charged for the call? Ask if, and how, your lawyer rounds up their charges. Many lawyers charge in six minute blocks - check if that's how your lawyer works. Make sure you feel comfortable with the way they charge. As with 'fixed fees', ask if there are any other costs that won't be covered in the hourly rate. Question 6 "Could my costs change? How will you let me know if they do?" There may be circumstances where costs do change. This is most likely if new information or developments make a case more difficult. For example, in a divorce case much is dependent on the other person's cooperation to resolve it quickly. Even if both people intend to behave amicably, sometimes that resolve breaks down. If your costs look like they are changing, ask your lawyer about it. In general, your lawyer should tell you as soon as they are aware of any changes, but you don't have to wait to ask for an explanation. Another option is to ask, when you choose your lawyer, if their original estimate is likely to be breached. If you have agreed a spending limit (see question 5), then your lawyer should stop work until you confirm that you want to continue. If a case gets complicated even a 'fixed fee' arrangement can change. Your lawyer should explain when this might happen and also set out the terms and conditions in your client care letter. Make sure you understand and ask if there is a 'get out' clause to say if additional costs can be charged. Remember, you always have options, even in the middle of a legal transaction. If there is a big hike in the costs of using a lawyer, then your lawyer should tell you about them and let you know what your options are. You could use a different specialist who might cost less but take longer, or only use email to contact your lawyer. There might also be some stages in the process that can be missed out. Ask your lawyer how you can work with them to reduce costs. Question 7 Are there any extra costs? This really is a catch-all question to help you budget for your service. You are basically asking your lawyer if they have given you all the information they reasonably can to make sure there aren't any nasty surprises in the future. Examples of the sort of information this question might raise are additional costs for things like expert reports (such as from a doctor), or photocopying. Some firms use premium rate phone numbers, which could add unexpected costs to the final amount you spend for your service. Use these examples as a prompt to discuss this issue. Your lawyer should also tell you if you are likely to incur any bank charges. For example, you might need to make a CHAPs payment (same day electronic transfer) which can cost over £20 in a property transaction. Finally, don't forget to check if your estimate is inclusive of VAT. Your lawyer should tell you, but check so that you don't get a higher bill than you're expecting. Question 8 "Can I get help with the cost of my legal service?" A lawyer should always talk to you about how the service will be paid for and discuss options such as insurance or membership of a union that might help cover the costs. There can be some fine-print with different insurance options that you need to understand, so ask lots of questions to make sure you know what you are signing up to. Some insurances, like 'after the event' or 'before the event' insurance, could cover you for some things but not for others. Ask your lawyer for more information. If you receive benefits or are on a low income you might qualify for help that may reduce or cover all of your costs. There are different programmes for different types of help but the best known is legal aid, which provides free legal advice from lawyers who are registered with the service. Even if your lawyer isn't registered to provide legal aid they should tell you about it so you have the option of going to a lawyer who can. Question 9 "When will I be billed and how long will I have to pay? Do you offer payment options?" A lawyer should give you clear information on their billing process and offer reasonable time for you to make payments. They should also let you know if there are penalty charges if you don't pay on time. You may be asked to pay some money at the start either to cover certain expenses or as an advance payment of fees. Lawyers aren't obliged to offer you payment options, but some may be willing to negotiate. Asking the question might help you find a lawyer whose service fits your personal circumstances. Question 10 "What happens if I disagree with the amount I've been charged?" Your lawyer should tell you their approach to resolving billing disagreements. Every lawyer should have a complaints handling system in place, so find out how their system works. You should not be charged by a lawyer for looking at your complaint - it is very poor service if they do. When you appoint a lawyer they are also obliged to let you know about the Legal Ombudsman who can help you to resolve your complaint if you and your lawyer can't reach an agreement. 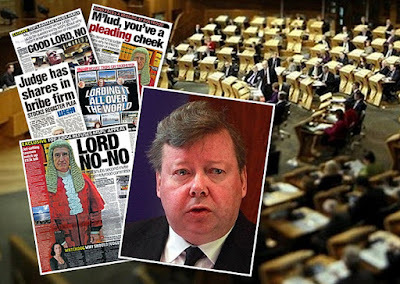 Note – if you disagree with legal bills in Scotland, cases have revealed solicitors often employ threats and legal action for demands to be met within seven days. In some cases solicitors have applied to sequestrate their clients for disagreements on legal bills, and willing, compliant local sheriff courts staffed by familiar clerks and members of the judiciary often grant such orders with little regard for the facts or any representations from clients who question the integrity of legal fees. 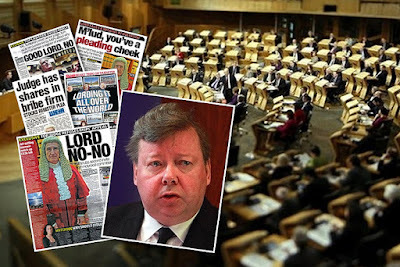 SCOTLAND – Consumer protection against rogue solicitors and law firms does not exist. 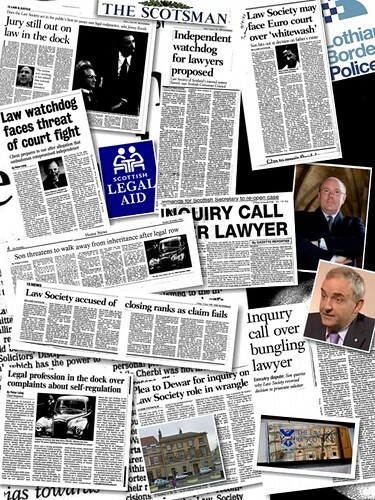 How bad is the Law Society of Scotland when it comes to protecting consumers? The answer is very bad. 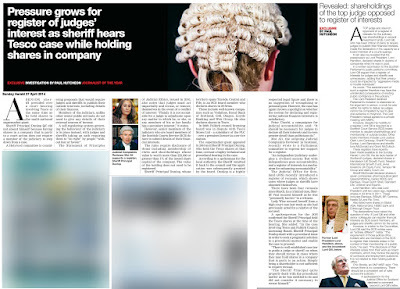 The Law Society of Scotland is a lobby group for the legal profession which puts lawyers interests first, before clients, the public, or anyone else. Do not expect client protection from a system where lawyers regulate themselves. 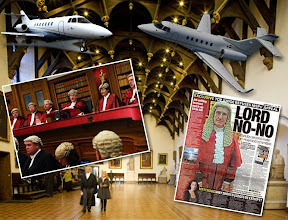 Read previous articles on the Law Society of Scotland here: Law Society of Scotland - A history of control of the legal profession, and no client protection. 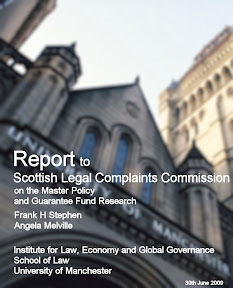 Previous media investigations, reports and coverage of issues relating to the pro-lawyer Scottish Legal Complaints Commission (SLCC) can be found here: Scottish Legal Complaints Commission - A history of pro-lawyer regulation. UK Solicitors regulator plans to publish more data on lawyers. A PROPOSAL to publish more detailed information about law firms and solicitors in a public register has been launched by the Solicitors Regulation Authority (SRA) – the body charged with investigating solicitors in England & Wales. The move to advance consumer protection south of the border by the English legal regulator could help consumers make more informed choices on the use of legal services, and result in a more competitive legal sector with higher standards of service and client care. 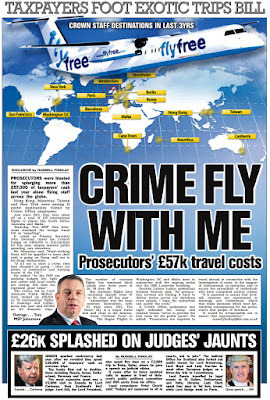 However, this is in stark contrast to Scotland, where DOI recently reported on the Scottish Legal Complaints Commission (SLCC) who refuse to publish any useable information to Scots consumers which could help clients steer clear from corrupt lawyers and law firms. 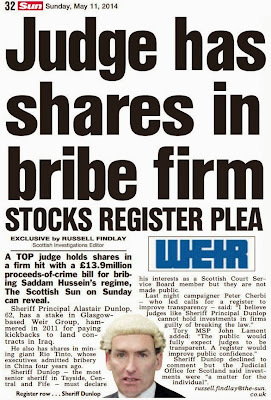 The report, available here: FROM ROGUES TO RICHES: SLCC refuse to identify corrupt solicitors in case findings revealed SLCC determination decisions are heavily redacted and only published after being approved by the Law Society of Scotland, leaving Scots consumers at a considerable disadvantage to consumers in England & Wales. However, and with the advantage of not being held back in the middle ages by the Law Society of Scotland, the England based Solicitors Regulation Authority has launched a discussion paper, "Regulatory data and consumer choice in legal services” exploring what information the SRA could publish through a public register. The proposed public register already allows consumers to check up on lawyers via the SRA’s Check your solicitor’s record service reported earlier here: INSPECT YOUR ROGUE: Check your solicitors’ record in England. The SRA suggests that consumers could benefit from information such as a solicitor’s qualifications or practice restrictions, and complaints data and insurance claims. The SRA also considers what information law firms might want to publish voluntarily, such as quality marks and service prices. The proposals echo recent calls by the Competition and Markets Authority's (CMA), in its interim report on its market study, as well as from the Legal Services Consumers Panel (LSCP), to improve the level of information available for consumers. The SRA agrees that a lack of clear, targeted information means it is difficult for consumers to compare providers and make informed choices. This is dampening competition in the sector. Better information could help tackle the problem that the legal needs of individuals and small businesses are not being met. Only one in ten people use a solicitor when they have a legal problem. And legal problems are estimated to cause small businesses almost £10 billion of losses a year, yet 83 percent of the population see legal services as unaffordable. Greater transparency would also bring legal services more in line with other sectors, such as financial services and energy, where regulators are already making sure consumer-focused information, such as complaints data, is available. The SRA recognises that there needs to be careful consideration of the implications of publishing more information. Risks to consider include increased burdens on firms and a one-size-fits-all approach working well for some and not others. For example, the needs of corporate clients will be different to those of an individual consumer. 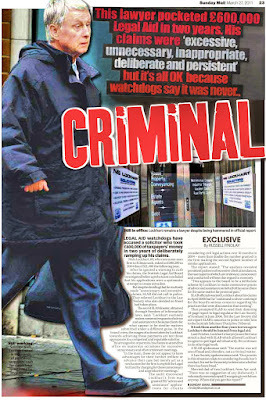 Paul Philip, SRA Chief Executive, said: "Most people and small businesses are still not accessing legal services. When they do, they are not shopping around. It is unsurprising when the information out there is so limited. "We want to help consumers, so they are not left making blind choices. Information such as enforcement action, complaints and claims data are exactly the type of things I would want to know when choosing a solicitor. "We know that the public look to the regulators to provide credible, authoritative, objective information. "If we get this right, we could help create a more competitive market, where consumers can make better choices and forward-thinking firms thrive. It will also help small businesses access the legal services that could help them succeed and grow. "Yet we need to think carefully about what we publish and how. More information will not benefit consumers if they find it confusing, hard to access, or it is unhelpful. We have also made good progress on getting rid of unnecessary burdens on firms. We will not ask firms to do more in this area, unless there is a clear benefit. "This is just the start of a discussion, so we are keen to hear what everyone thinks." The SRA has already taken steps to improve the information available to consumers by publishing its law firm search in April. And it already publishes details of enforcement action. Publishing useful data in one place would not only help consumers directly, but indirectly as data re-publishers could use it to develop comparison tools that could help make the market more competitive. The SRA plans to consult on proposals in this area next year. Its discussion paper can be found at: www.sra.org.uk/choice. Closing date for submissions to the consultation is 26 January 2017 submissions. The CMA's interim report looking at ways to improve competition in legal services by increasing information for consumers is available at: www.gov.uk/government/news/cma-seeks-views-on-ways-to-help-legal-services-customers. The Legal Services Consumer Panel's research, "Opening up data in legal services (PDF 36 pages, 625K)"
SCOTLAND: Legal Services Consumers held back by Law Society of Scotland & self regulation. 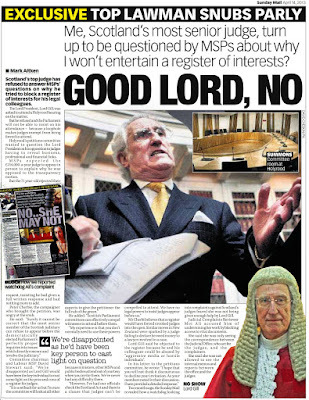 Away from the fantastical claims of the Law Society of Scotland, the oh-so-easy free pr and spin of how the Law Society protects access to justice while offering client protection, the fact is, consumers of legal services in Scotland have no chance whatsoever of selecting a legal representative based on their regulatory history – because the Law Society of Scotland refuse to publish any detailed regulation histories of their members. 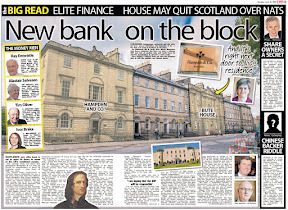 Just how bad is the Law Society of Scotland when it comes to protecting consumers? The answer is very bad. Read previous articles on the Law Society of Scotland here: Law Society of Scotland - A history of control of the legal profession, and no client protection. 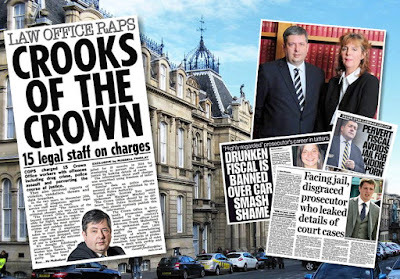 A BBC Scotland investigation “Lawyers Behaving Badly” exposed further weaknesses in the Law Society of Scotland’s system of control freakery self regulation. 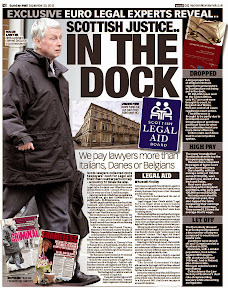 The BBC programme lifted the lid once more on lawyers investigating their own, how dishonesty plays out at the Scottish Solicitors Discipline Tribunal, and legal aid fraud. 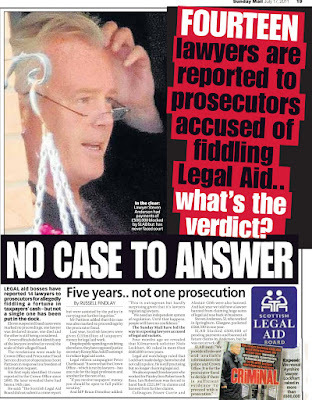 A recent DOI investigation into the Scottish Legal Complaints Commission revealed most of the SLCC’s key staff and investigators are in-fact families, friends & business associates of solicitors, reported here: 'Independent' Scots legal watchdog consists of solicitors’ husbands, wives, sons, daughters, cousins, friends, & employers. 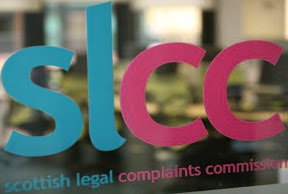 Previous media investigations, reports and coverage of issues relating to the SLCC can be found here: Scottish Legal Complaints Commission - A history of pro-lawyer regulation. Consumers are not protected by lawyers regulating lawyers. 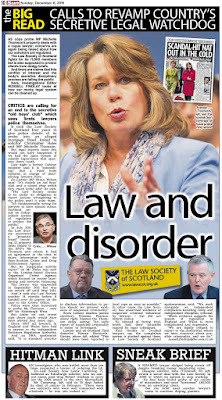 SCOTLAND’S legal profession and anyone connected to it – including the judiciary - often praise the system of self regulation where lawyers look after their own – to the point of taking over and closing any public debate on creating independent regulation of solicitors. 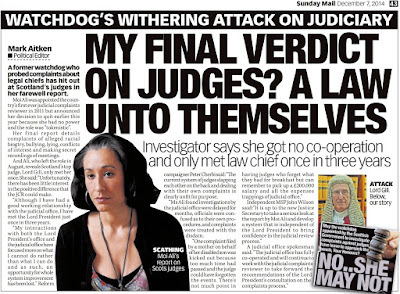 And, of course lawyers will continue to regulate themselves in Scotland - because self regulation is too protected by vested legal interests, because it allows a solicitor to rip off their client, to be judged by his colleagues and to walk away from it, no matter what was done to the client. 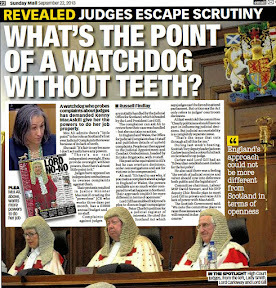 Time and again, lawyers look after their own, investigate themselves, appear in front of their friends at the Scottish Legal Complaints Commission (SLCC), and, at most, receive a censure, or slap on the wrist from the Scottish Solicitors Discipline Tribunal (SSDT). 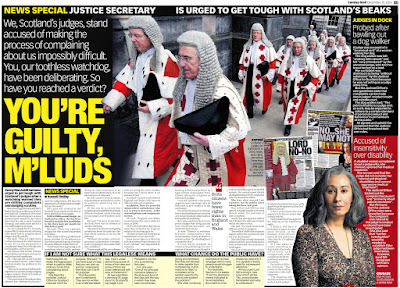 Diary of Injustice recently reported on how the SLCC refuses to identify corrupt lawyers within determination decisions which are only published after being approved by the Law Society of Scotland, featured here: FROM ROGUES TO RICHES: SLCC refuse to identify corrupt solicitors in case findings. 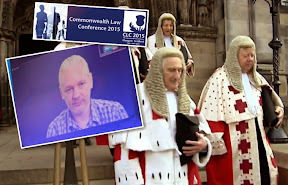 The SLCC print lists of doctored histories of complaints against lawyers, and then refuse to identify the solicitors who ripped off their clients – how corrupt is that! Compare this to England & Wales, where decisions made by the Solicitors Regulation Authority in relation to identified law firms and names of solicitors can easily be found here Recent Decisions - Solicitors Regulation Authority. Striking's off rarely occur, only as a last resort for the members of Scotland’s legal profession must protect their own. The slick SSDT website invites you, the public – to have confidence in the ways lawyers look after their own. 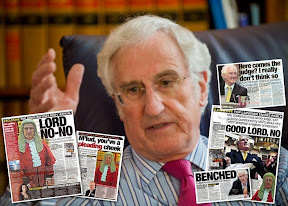 Yet in decision after decision, the extent of dishonesty during proceedings renders much of what is published in Tribunal ‘interlocutors’ as clever forgeries of the acts of wilful, determined and well practiced thieves - far more determined than will ever be told in public. The noticeable lack of action by the SSDT to report solicitors to the Police & Crown Office for prosecution, does, as the years go by, verify the position that the SSDT seeks to protect solicitors from the full weight of criminal law – which applies to everyone else. However, on that rare occasion where solicitors do appear in court, you just know they are not going to jail. In a prime example of the above, earlier this week Scotland was meant to weep like a child after the Law Society sought to publicise the fact Paul O’Donnell – a solicitor from the law firm of Thorley Stephenson, in South Bridge – had sold his house to repay more than £21,000 he pled guilty to embezzling from the Edinburgh law firm Thorley Stephenson, in South Bridge . O’Donnell, 35, had previously been warned he was facing jail for the embezzlement but the judge – Sheriff Frank Crowe - allowed him to remain free as he had repaid the £21,485 he had obtained dishonestly. In court - O’Donnell’s defence lawyer - Murray Robertson told Sheriff Crowe that his client had sold his house, moved in with relatives, and the money had been repaid to Thorley Stephenson. Sheriff Crowe was also told O’Donnell had been sequestrated, was declared bankrupt and is no longer practising as a solicitor. In response, Sheriff Crowe told O’Donnell that cases of this nature usually involved a sentence of imprisonment but, as O’Donnell had co-operated and admitted his guilt, arranged the sale of his house and returned the money to Thorley Stephenson, Sheriff Crowe avoided sending O’Donnell to jail and instead confined him to his current address from 9pm to 6am for six months. You may be forgiven for thinking how amazing a lawyer who stole, avoided jail. However, in the rare occurrences when solicitors do come before our courts, jail is always a last resort for the judge – who are themselves, lawyers. 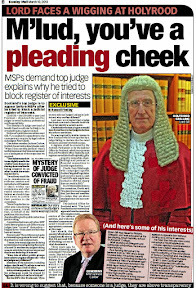 So, with facts in hand that our courts take a shine to lawyers with tears in their eyes, it should be of little surprise the latest rulings by the Scottish Solicitors Discipline Tribunal offer mere censures and fines for executry and will fraud, theft and embezzlement - which are crimes to ordinary people in the real world. This case involved a solicitor in his writing and executing a Will in which his family were the Primary Beneficiaries. An amazing story, yet only punishment is a fine. Edinburgh 29 August 2016. The Tribunal having considered the Complaint at the instance of the Council of the Law Society of Scotland against Euan Maxwell Terras, Sprang Terras, 64 Kyle Street, Ayr; Find the Respondent guilty of professional misconduct in respect of his acting in the purchase of a property with the ancillary execution of a Minute of Agreement and the drafting of a Will where his son was the residuary beneficiary and found that in doing so (1) he acted in an actual conflict of interest situation in the purchase of the property and the execution of the Minute of Agreement where he had a personal and/or financial interest in both; (2) he did not insist that Miss MM consult other solicitors either in the purchase of the property or the execution of the Minute of Agreement when both were actual conflicts of interests; (3) he could not discharge his professional obligations to solely look after the interests of Miss MM both in the purchase of the property and the execution of the Minute of Agreement given the actual conflict of interest in both between him and Miss MM; (4) he called into question his personal integrity/independence in taking instructions and/or drafting the second Will which benefitted members of his family and in terms of which they would derive significant benefit; and (5) his advice, given the terms of the draft second Will, was not free from external influence and placed him in a conflict of interest; Censure the Respondent; Fine the Respondent the sum of £8,000 to be forfeit to Her Majesty; Find the Respondent liable in the expenses of the Complainers and of the Tribunal. Philip Hogg was one of a two-partner Kirkintilloch firm - Alder Hogg. His co-partner was his twin sister Alison Hazel Margaret Greer. The case relates to massive overcharging of clients. – usually defined as fraud if not involving a solicitor. The following is for one client: The Interlocutor final amount is that for £129K of legal work they charged £219K for £90K more than they should have. So, for this one client, in relation to Mr A's executry, it is accepted that £90K was overcharged, however the Tribunal does not explain why a staggering £129K of executry fees was deemed acceptable. Elizabeth Steer worked for a Falkirk firm RMS Law. She previously worked for Russell & Aitken and now works for Allan McDougall & Co.
Ms Steer was accused of falsifying an Affidavit. The affidavit complied with neither of these tests, instead Ms Steer sent it to her client in England to sign and return. Problems with the affidavit only came to light when the client gave evidence stating that she had not been in Scotland for a while - but when at Avizandum the Sheriff realised that the Affidavit was signed in Scotland at a time when the client swore she was in England. And remember, readers - wherever there is dishonesty, there is a Scottish solicitor, and the Scottish Solicitors Discipline Tribunal. 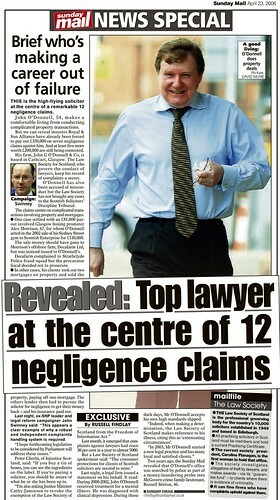 An investigation by BBC Panorama - Lawyers Behaving Badly - featured the case of John O’Donnell, and went on to reveal the startling differences in how dishonesty in the Scottish legal profession is treated lightly compared to England & Wales – where dishonesty is automatically a striking off offence. 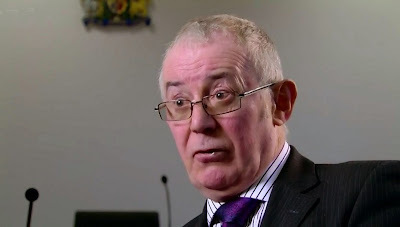 Alistair Cockburn, Chair, Scottish Solicitors Discipline Tribunal. 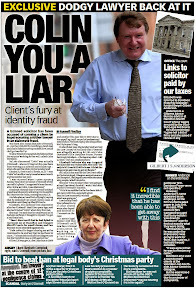 Featured in the investigation was the Scottish Solicitors Discipline Tribunal (SSDT) Chairman’s attitude towards solicitors accused of dishonesty in their representation of clients legal affairs. 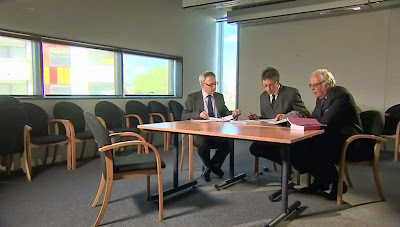 During the programme, it became clear that dishonesty among lawyers in Scotland is treated less severely, compared to how English regulators treat dishonesty. Sam Poling asks: The Scottish Solicitors’ Discipline Tribunal hears all serious conduct cases against solicitors. Last year they struck off nine of them. But is this robust enough? Alistair Cockburn Chairman, Scottish solicitors discipline tribunal replies: It is robust in the sense that it doesn’t just give convictions on the basis that somebody’s brought before us charged by the Law Society. We are mindful, particularly when reminded of the lay members, of a duty to the public. 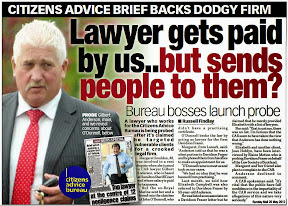 One is always concerned when there is deception but you can have a situation where solicitors simply lose their place. They make false representations in order to improve their client’s position, not necessarily their own. And you would take that into account in deciding what the penalty was but there’s no suggestion that such conduct wasn’t deemed to be professional as conduct. Sam Poling: So there are levels of dishonesty which sit comfortably with you, satisfactorily with you? Sam Poling: OK that you would accept? 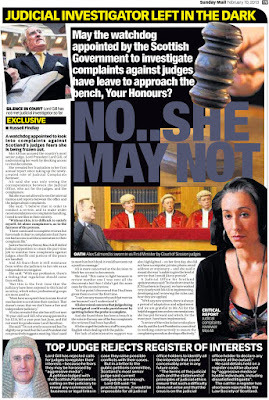 Alistair Cockburn: No I’d be concerned on any occasion that a solicitor was guilty of any form of dishonesty. One has to assess the extent to which anyone suffered in consequence of that dishonesty. You have to take into consideration the likelihood of re-offending and then take a decision. But you make it sound as if it’s commonplace. It isn’t. Normally dishonesty will result in striking-off. English QC’s agree ‘dishonesty’ is a striking off offence. 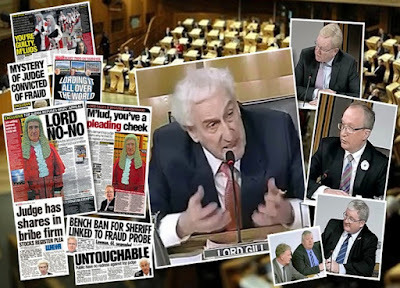 The SSDT Chairman’s comments on dishonesty compared starkly with the comments of the English QC’s - who said dishonesty was undoubtedly a striking off offence.